Price: £8.49 (incl VAT) Sorry, this item is currently unavailable. Click here to receive notification when this product comes back into stock. Peppermint oil capsules are well known to help with the discomfort of IBS. 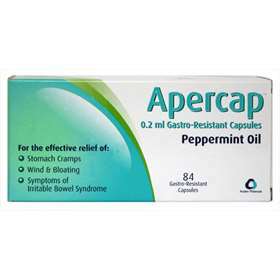 Apercap peppermint capsules are good for the relief of indigestion, wind and bloating. Peppermint oil helps to relax the muscles in the bowel wall which then leads to easier digestion to ease stomach cramps. Each capsule contains 0.2ml peppermint oil. Please read in full the patient information leaflet inclosed. Take 1 capsule three times a day, preferably before meals, Take with a small amount of water. Do not break or chew the capsule. Do not take straight after food. If your symptoms are more severe you may take two capsules three times a day. Peppermint oil 0.2ml,Gelatin, Glycerol, Purified water, Titanium dioxide powder, (E171),Chlorophyllin copper complex sodium (E141), Aqua polish and Propylene glycol. Product code: 3622396 Price: £8.49 (incl VAT) Sorry, this item is currently unavailable. Click here to receive notification when this product comes back into stock.